Nd:YAG laser designers have devised many ways to deliver electrical power to flashlamps and DC arclamps. Various lamp connection hardware arrangements have been devised to efficiently deliver high power (typically 3-8kw) with a minimum of resistance. 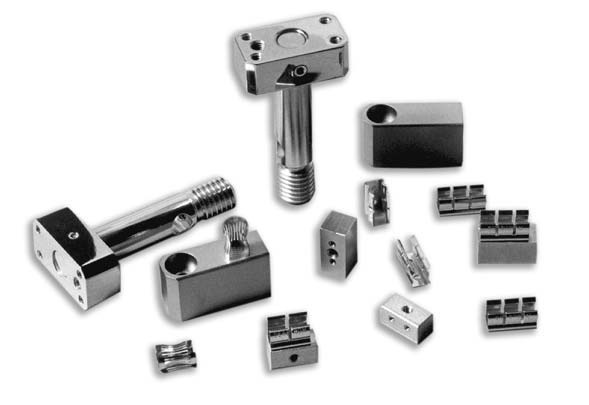 The simplest lamp connection designs consist of a gold plated fuse clip (providing low surface connection resistivity) attached to a terminal block with machine screws. The whole assembly is immersed in deionized water in the laser head. Since the connection is entirely submerged, the thin cross section clip does not encounter thermal problems. If the connector is not completely submerged, a more complex design is required. Various combinations of sockets, insulators, and spacers may be employed: some have built-in cooling water channels, and some require elaborate manufacturing techniques for joining metallic conductors to nonmetallic insulators.